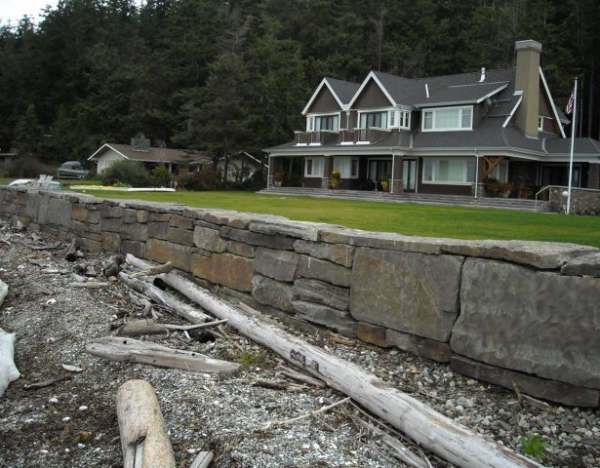 Landscaping walls make a great addition to any yard. They add interest in all seasons. 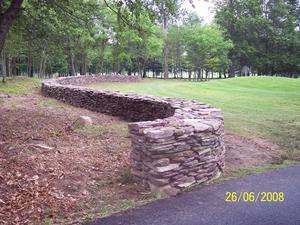 A stone garden wall has also become a very popular project for do-it-yourselfers. 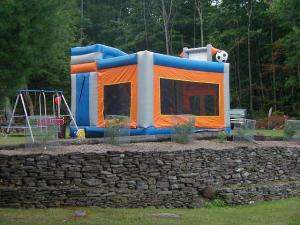 If you are wondering what else dream yard has to offer, you can easily find it all by clicking on our sitemap. 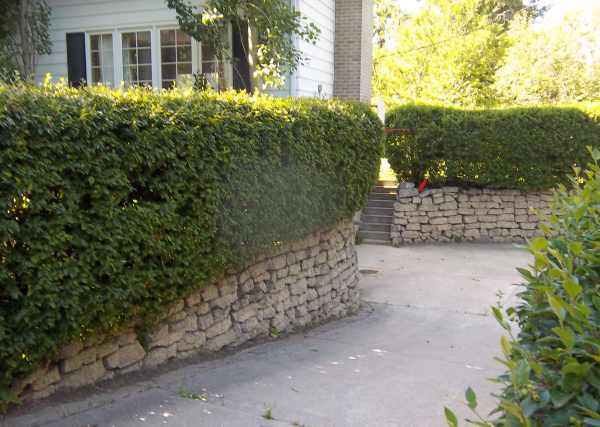 If you are considering adding a wall to your yard, you may also want to check out our very popular and helpful article on landscaping a slope. Just click on any landscaping wall photo to open a gallery slideshow of all the photos on this page. 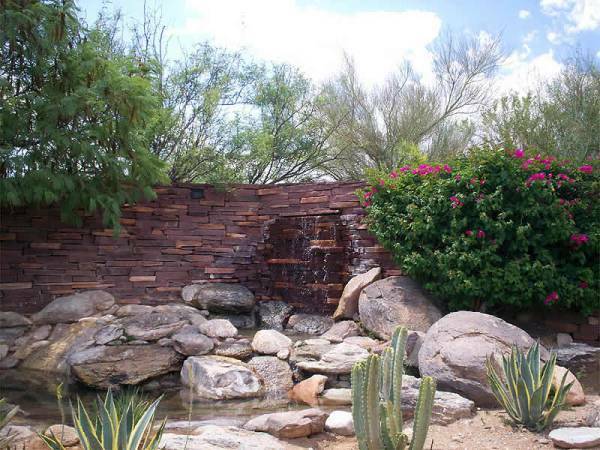 Natural stone, brick, garden walls, and wooden walls can have different functions in our yards. 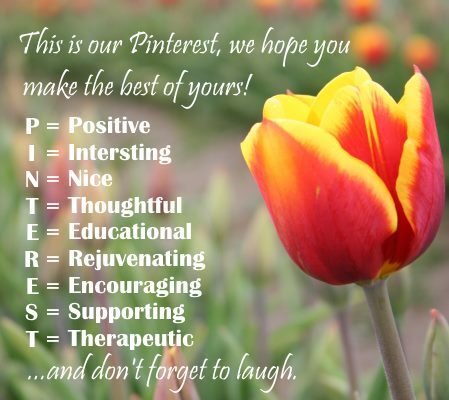 We can use them to retain, hide, compliment, divide, or decorate. 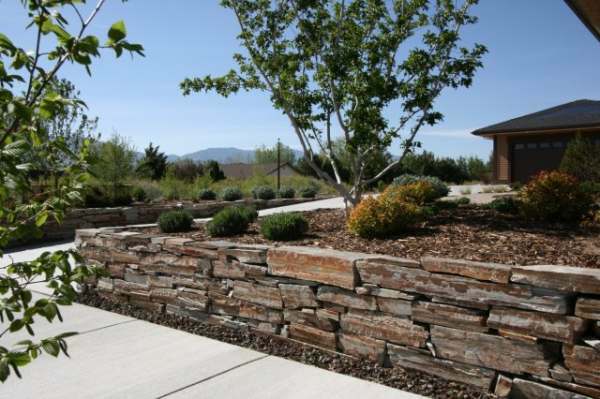 Whatever reason you have for adding a landscaping wall to your yard, this section is just one more way to show the different uses of materials available to you. 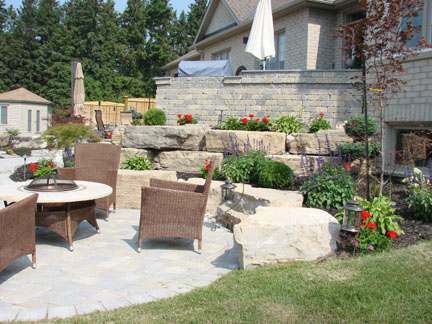 We have some great retaining wall ideas using stone, landscaping timbers and boulders. 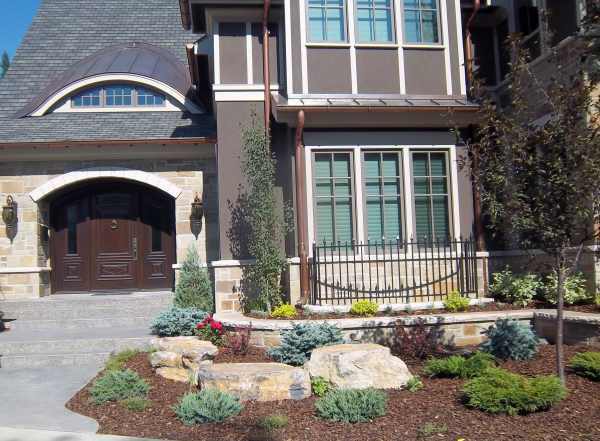 The large rocks and tree used here add needed height to this front yard landscaping design. 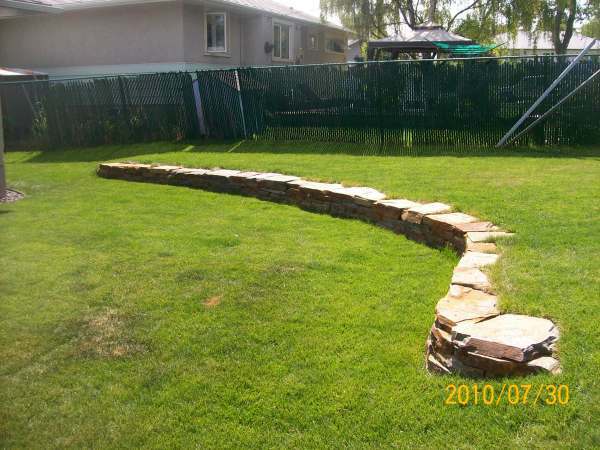 A single tier of large block placement stones is another easy and effective way to landscape a small frontyard slope. while still giving height to this water feature. clean lines, and accent the garden beds nicely. 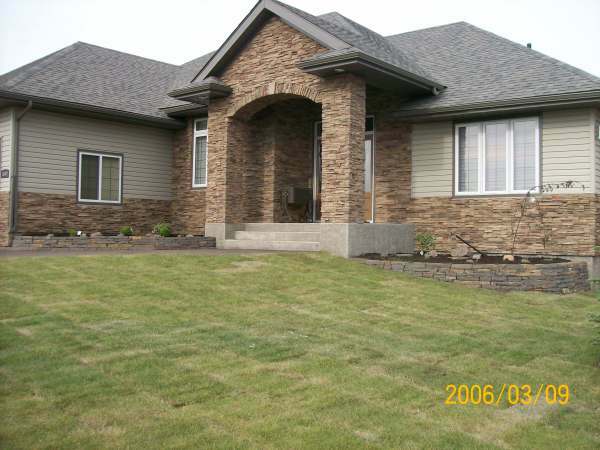 Small front yard design mixing formal and informal elements. 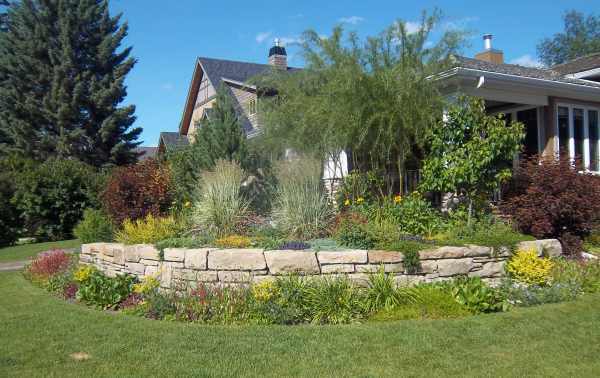 Mortared stone walls softened by random boulders and a mix of shrubs for year round color. placed trees or shrubs as shown here. 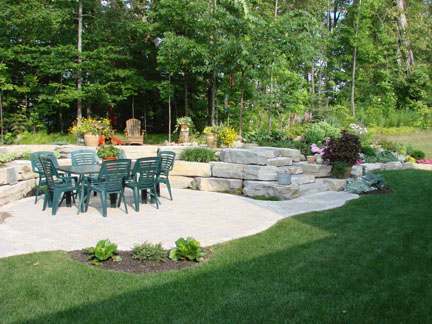 A patio with a firepit is complimented with a wall built out of very large stones. They can provide extra seating as well as make nice planters for garden beds. 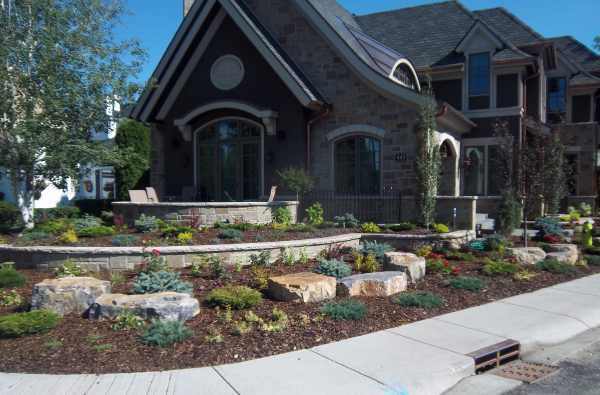 Beautiful corner lot landscaping with formal stone walls are inter-planted with a shrub and mulch rock garden. The upper wall encloses a lovely little patio area. 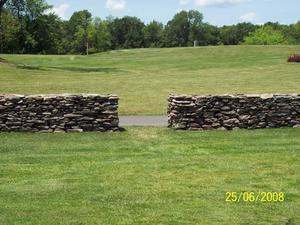 A children's play area is surrounded by this stone wall. Smaller stones require some advanced stacking techniques for stability of the wall. way to save money on materials for building walls, walkways, and paths. that will never rot, rust, or decompose. 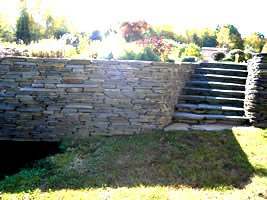 This flagstone wall curves nicely into a set of natural stone steps. by a highly skilled builder. cardboard tubes from the deck construction. what goes in to building walls like this. adds some contrast to the dark coloured wall stone. 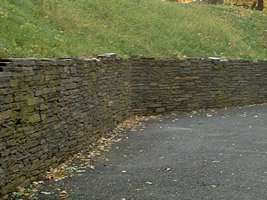 "Placement walls", are large rock walls where specialty equipment places each stone. 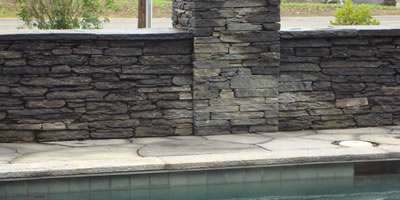 Less than perfect capstones provide added character to this wall. now be purchase at stone yards (thankfully). less formal upper sitting area. 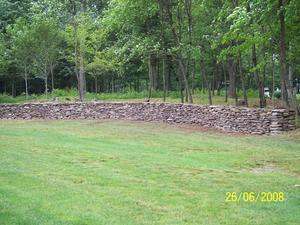 A free standing dry-stacked wall with nice flowing curves meanders across this property. 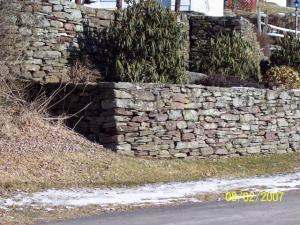 Fieldstone walls like this are very common in New England. the useable area below it. Wallstone is used here to line the driveway and support raised beds on both sides. This stone contains colours from both the house and the mulch. 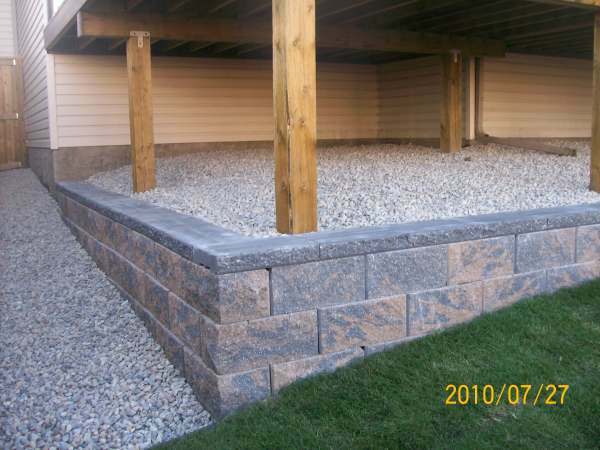 This low retaining wall adds more interest to this yard with a slightly sloped backyard. Adding garden beds in and around the wall will soften it up with colour. 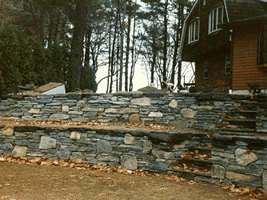 This multi level flagstone wall with fieldstone mixed in at various spots, has tons of character. 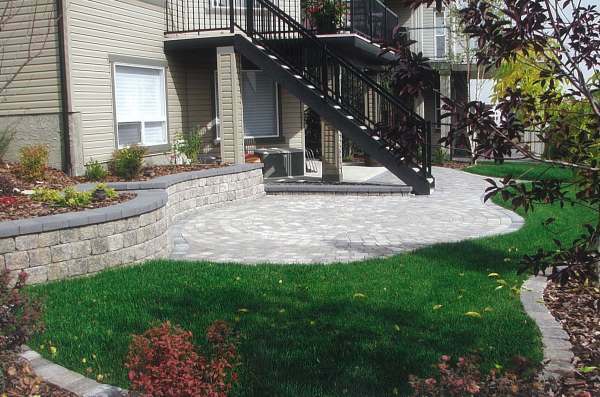 Stairs always add convenience to yards with a retaining walls.